To encourage many desiring young population to take up the nursing career: One of the best professions mankind has ever experienced. To bring up qualified nurses to work in major hospitals in India and abroad. To serve as a base for further professional education and specialization in various fields of nursing. To prepare nurses to keep pace with the latest professional and technological developments in improving nursing care services. To prepare the nurse as a community nurse which is the need of the hour to focus on eradication of communicable and preventable diseases. 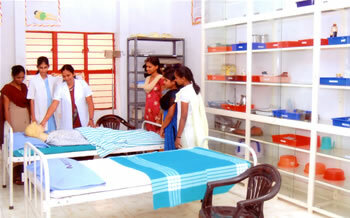 To initiate future development of starting nursing college and carrying out graduate and post-graduate nursing education. Admission is open to all eligible candidates with the following requirements. a. Age: Between 17 and 35 years. b. Minimum Qualification: A pass in 2nd PUC or 10+2 years of equivalent qualification. c. A good working knowledge of English is essential as the medium of instruction is English. i. Attested copy of SSLC marks card. ii. Attested copy of PUC marks card. iii. Attested copy of Transfer Certificate from the college. iv. Eight (8) passport size photographs with signature. v. Migration Certificate for students from outside Karnataka. The course shall be of three and a half years duration of which six months will be internship (subject to regulatory changes by the Government). Hostel facilities will be provided if required. Prospectus and application forms can be availed by sending DD for Rs 250 in favour of "Mitra School of Nursing" drawn on any bank at Udupi.